Classy retro-style revolving restaurant in the heart of downtown. 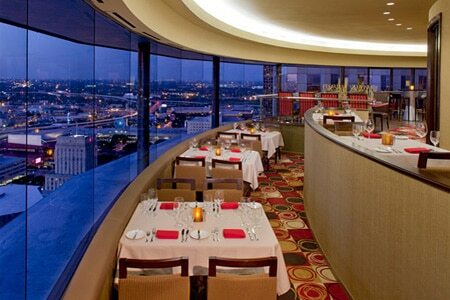 : High atop the downtown Hyatt Regency is the city's only revolving restaurant. Spindletop, named for the oil well that started the state's oil boom in 1901, is only open for dinner Tuesday through Saturday, but the spectacular view of downtown makes it a special occasion place, especially for visitors. Executive hotel chef Frank Majowicz turns out a regional, seasonal menu using locally sourced produce. A classic appetizer is the avocado dome with jumbo lump crabmeat and jicama slaw. The restaurant also offers a signature paella using spicy chorizo sausage mixed in with the seafood. Mesquite smoked chicken, seared salmon and grilled beef filet may round out the entrées. Pastry chef Regina Martinez whips up sweets such as apple jalapeño tarts served with dulce de leche ice cream, and the signature chilled Grand Marnier chocolate soufflé. The wine list puts a focus on California wines.